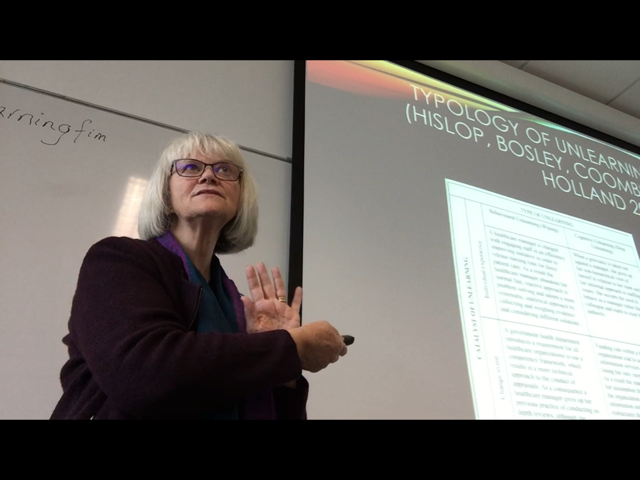 Meet Dr Sue Greener, a published author, sheep breeder and one of our part-time Principal Lecturers supervising final-year undergraduate business and doctoral students with their project work. I teach on the Joint Honours Programme in Hastings. I am the Business strand leader for students remaining in study in Hastings, teaching Business Enterprise and Research Practices and Applications and supervising final-year business projects. I work part-time at the University of Brighton. This means I teach and supervise doctoral research in my days on campus. My career has always been a portfolio of varied activities. I also co-run a consultancy business, this has been ongoing for thirty-years now and keeps me abreast of the challenges of SMEs, VAT, invoicing, new business development and so on. I also write, examine and supervise for a range of other educational organisations. My degrees, the last two I studied part-time, have opened doors to huge opportunities and have enabled me to work in public, private and voluntary sectors, collaborating with people in the automotive, charity, agricultural, healthcare and technology industries as well as many local small businesses. The modules taught in Hastings support a Joint Honours degree in which students can study Business with either Mathematics or Computing. Business Enterprise was part of the Business with Enterprise BSc which used to run in Hastings and was designed on the basis of problem-based learning, putting the problem first and pulling in ideas and knowledge to help resolve or learn about it. Final-year Business Enterprise students are finding local business networks to attend and evaluate as part of their assessment, bringing that live experience into the classroom. My excitement around teaching stems from interaction, maintaining close contact with the current business environment and introducing students to debates about current trends and challenges in business. As business graduates they must have developed a strong ability to monitor and interact with the political, social and economic changes which will shape their career. I am also a strong advocate for rigour in business research, trying to enable students to evaluate the media they use, be that academic journal content or tweets, blogs and video content online. Tell us about any projects you’ve been working on outside of the classroom. I have two books in current publication about research methodology, one a simple entry level e-book for undergraduates just about to present a third edition, one a broader postgraduate book which includes authors from a wide range of fields and universities. I also supervise Doctorate of Business Administration students online; I lead and teach on a fully online business top-up programme; and I co-edit an academic journal. All these things are projects involving other colleagues, working with them is a joy. Recently I also appeared on Czech TV after delivering a keynote presentation at the University of Hradec Kralove at an eLearning conference – you can view the video here on Facebook (but most of it is in Czech!). In my spare time, I am also a grandmother and breeder of pedigree Southdown sheep, with lambing carefully scheduled for the University’s Easter vacation! You can also view my blog here and on Twitter @suegonline. My main fields are human resource development and management, strategy and research methodology – there is a sense of multi-disciplinarity about what I do. Managing businesses requires the flexibility to connect and meld ideas and techniques and to be able to get them across well to others. That is what I enjoy about teaching. Tagged Business, lecturers, staff. Bookmark the permalink.